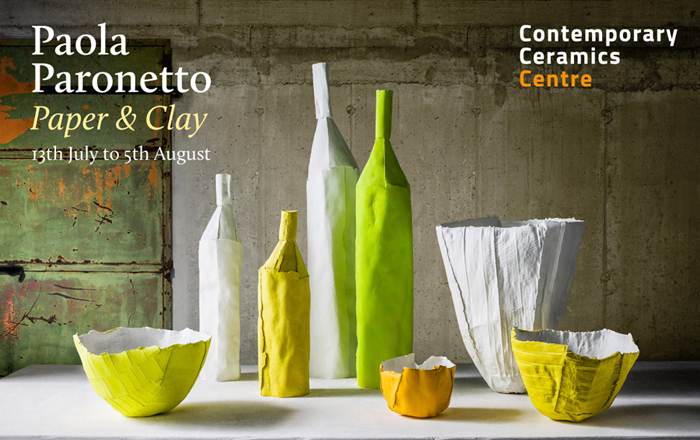 As part of her solo exhibition Paper & Clay, we are hosting a special event with visiting Italian ceramist Paola Paronetto in conversation with Andre Hess, ceramic sculptor, Fellow of the Craft Potters Association and a collector of fine art and ceramics. The discussion will investigate how Paola’s years of development and experimentation resulted in the masterful works of paper clay we see today. Discover the reasons behind Paola’s refinement of her paper clay formula, and why strong colour and bold, confident forms feature so heavily in her current range of work. Paola Paronetto was born in 1965 in Pordenone, Italy. Her artistic journey has been strongly influenced by her continuous experimentation in the paper clay technique, and by her time teaching at the La Meridiana School of Ceramics in Tuscany. She has been refining her own unique version of the paper clay technique for over ten years, and has over thirty years’ experience as a ceramicist. Andre Hess, himself a celebrated and highly collected abstract ceramic artist, has first-class degrees in Art History, Veterinary Science, and Public Health. He also writes fiction. Please note: this event follows the Exhbition Preview (5.30pm to 7.00pm) and it is possible to attend both.